LOS ANGELES—A ten-year landmark has just passed in this city. Only a few thousand people took notice of it, but wow, did they stand up and cheer! 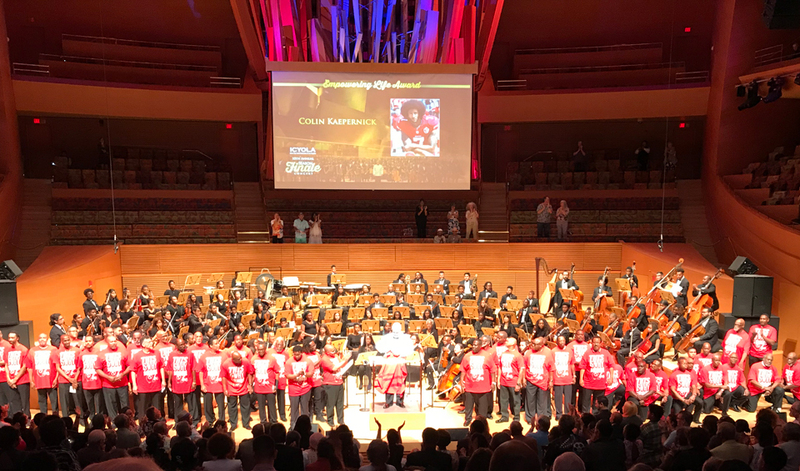 The Inner City Youth Orchestra of Los Angeles is celebrating its first decade of serving minority youth, especially African-American and Latinx, helping them to master musical instruments and learn the great orchestral literature of the world. Some of the 356 young men and women who have been reached throughout ICYOLA’s ten years so far are making careers in music; others may become accomplished amateurs but go on to make their mark in other fields. The orchestra is now 110 strong, having started off in 2009 with “The Founding Nine” students who wanted some guidance over a five-week summer program that soon blossomed into a permanent institution. I first became aware of ICYOLA this spring, when it marked in music the 50th anniversary of the death of Martin Luther King Jr. The orchestra’s guiding principles are: Accomplishment, Pride, Camaraderie, Confidence, Respect. These principles will take young people far in life, whatever their chosen endeavors. I sat next to a man in Row G whose son Brandon Glasgow plays violin in the orchestra. He pointed his son out: Right in front, second row, just behind the concertmaster. Is he of college age? I asked. Oh, yes, proud dad answered, He’s going to the University of Iowa this fall, majoring in music. Midway in the generous, varied program at Walt Disney Concert Hall, conductor, founder and executive director Charles Dickerson asked the audience to recognize another violinist playing with the orchestra that Sunday afternoon: Nader Shayegh. It was Nader, right after the February 2012 shooting death of 17-year-old Trayvon Martin in Florida, who proposed that the entire ICYOLA put on hoodies and perform in front of the L.A. courthouse. Members of the orchestra are more or less of Trayvon’s age. Dickerson had another reason to be proud of Nader. In May, Nader was the first ICYOLA alum to graduate from Harvard University, a cognitive neuroscience and evolutionary psychology major with a secondary field of African-American Studies. He’s starting soon at the Dana Farber Cancer Institute as a full-time clinical research coordinator for multiple myeloma, and has future plans for medical school. Almost all of ICYOLA’s graduates so far have gone on to college. The musical offerings of the afternoon began with John Williams’s famous brassy Superman March, accompanied by an expertly edited selection of clips from the comic and film hero’s daring escapades. Guest maestro Dwayne Burrell, a brilliant young clarinetist currently studying conducting, took the podium for Sergei Prokofiev’s Symphony No. 1, the “Classical” Symphony, in which the budding composer took the formal structure of the four-movement 18th-century classical period symphony, and made it his own with piquant 20th-century harmonies. Dickerson introduced Burrell by way of saying it’s always his job to nurture future talents who can also take over from himself when the time comes. Concluding the first half, Dickerson presented the world premiere of his 12-minute cantata with full orchestra, This Is Why We Kneel. In conjunction with the performance, the orchestra gave its Empowering Life award to football player Colin Kaepernick, who initiated the movement to “take a knee” during the playing of the national anthem before NFL games as a peaceful, nonviolent way of calling attention to the continuing issues of racial injustice and excessive police violence in America that contrast so tragically with the “land of the free, home of the brave” spirit that the anthem describes for America. Kaepernick was not able to be present for this occasion, but a video about him featuring him in a recent speech (and with an elegant new hair design!) was screened. Dickerson amplified the message against police violence to also add, “And don’t be killing each other!” which received vocal support from the audience. With the orchestra assembled on stage, the fifty men comprising the chorus filed on in two rows. Most of them had obviously memorized their parts, for no one carried a score, although a few referred to their cell phones or small sheets of paper to reassure them of the text. While the musicians performed, a powerful video encompassing the entirety of American history, showed the never-ending sequence of punishing people in America for “living while Black”—slave auctions, beatings, whippings, Jim Crow lynchings, voter suppression, attacks on civil rights marches, and always, killing, killing, killing. It took considerable courage to program this work as the nation headed into the 4th of July celebration. This was the true “patriotic” counterpoint to the false populism of a supposed shared national identity that some citizens force on the country as they parade their sacred right to oppress other fellow citizens. The Revolutionary Era ideal of e pluribus unum—“out of many, one”—simply cannot be recalled uncritically anymore until some essential understanding is achieved that for many classes and races, that America has simply never existed. The orchestra started off with insistent, low pounding rhythms, which grew in power from repetition as the chorus joined in with its achingly sorrowful words. The choral writing had a chant-like character, as if, with orchestral punctuation, a crowd of militant, singing marchers were approaching down the street and into the concert hall. Their hearts, and all of our hearts as listeners, beat as one. “Stop the killing”—over and over and over, but nowhere near the number of times African-American people have been gunned down on our sidewalks and front yards. Over and over, but nowhere near. The musical style reminded me of the male choral sound that Kurt Weill often incorporated, into such works as The Seven Deadly Sins or The Rise and Fall of the City of Mahagonny. Others might hear the pagan-inspired texture of Carl Orff’s music, such as Carmina Burana. More to the point, it summoned up African-American work refrains, in the fields, on the job, on the prison farm. But the chorus took on a special, different character here: It’s as if the fathers, the brothers, the elders of the Black community were trying to assert their manly protector role over the nation, as if to say, We are demanding that you stop now, in the name of decency, stop and think what you are doing to our people and our country! 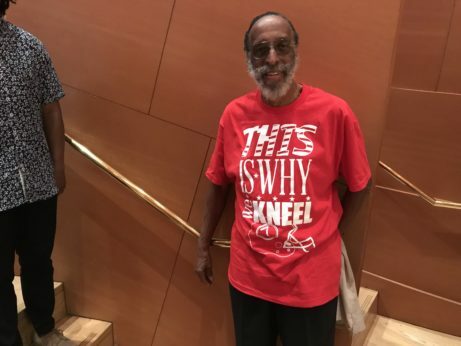 It is so vital that an American audience (mostly African-American at Disney Hall) could hear This Is Why We Kneel when at this time of year we’re far more likely to hear fulsome patriotica that only belies the American reality as it pumps out nationalistic propaganda for mass consumption. The time for honest conversations is long overdue. No one hearing this new choral composition will ever look askance at those who take a knee. In fact, the audience could not contain itself as the work unfolded—they joined in singing, applauding, yelling their support for the chorus and its plea. The blood of young Black men flows in the streets of America at the hands of officers of the law. The scene plays time and again: Black men dying in America at the hands of officers of the law. We cannot just ignore Black men dying in America at the hands of officers of the law. Our purpose to implore: stop this killing in America at the hands of officers of the law. This, this, this is why, this is why we kneel. Violence gets normalized when Black men are killed in America at the hands of officers of the law. All lives are jeopardized when Black men are killed in America at the hands of officers of the law. We respectfully take a knee to stop this killing in America at the hands of officers of the law. For now we heed the cry: we cannot just stand by and watch as young men die, at the hands of officers of the law. So when the anthem sounds, together on the ground we offer our appeal. This is why we kneel. Stop killing these young boys! Stop killing these men! Stop killing these fathers! Stop killing these children! This is why we kneel! In the second half, ICYOLA paid tribute to Leon “Ndugu” Chancler (1952-2018), drummer and percussionist, producer, composer, clinician and educator, whose impact not only in Los Angeles will be felt for decades to come. 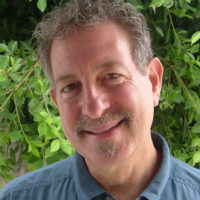 He played on scores of recordings with every top name in the business, and also mentored students in many academic and clinic programs throughout the world. Sidney Hopson, an orchestral, studio and solo percussionist from L.A., performed a mesmerizing solo on a drum set, joined by actor, singer, dancer, director, writer and producer Obba Babatundé on bongos and vocals. Once they started drumming and chanting together, they demonstrated a masterful example of listening, responding, echoing, answering, improvising and inventing. Dressed in tuxedo and all white, respectively, they represented the entire range of music from its ancestral roots to its orchestral expression, showing in vivid color how Africans brought with them the rhythms that would set the foundation for American music. Conductor Dickerson invited Chancler’s life partner and son to the stage to receive a Lifetime Achievement award from ICYOLA. The next tribute went to the ever popular entertainer Nat King Cole, featuring vocalist Keith David, known to millions as an actor who plays tough-guy sergeants in war movies. David crooned through a medley of eight “unforgettable” Nat King Cole numbers in warm, credible interpretations that only lacked that extra ounce of vocal honey that Cole was known for. For my taste, the orchestra played its best in these arrangements. There were the inevitable “Mona Lisa” and “Nature Boy,” but my favorites were the worldly wise “Where Did Everyone Go?” and the bluesy “Azure-Te,” which featured a fine trumpet solo by an ICYOLA player. Sidney Hopson was kind enough to stick around and perform with the orchestra in this plush, romantic set. A video introduced us to Rosemarie Cook-Glover, now “90 years young,” who has dedicated all her life to young people’s musical education. At a time when the Musicians Union was segregated, only whites performed on the great studio film recordings, and Cook-Glover was one person who sought to change that. She was a founder of the Southeast Symphony and its conservatory of music, which set out to train musicians of color to be able to perform symphonic music, and still remains active with it. She came to the stage to receive a Lifetime Achievement award from ICYOLA. What an education the audience receives every time it attends an orchestra concert—and by the way, props to those who worked on the printed program, a model of excellent graphic design and informative content! The afternoon concluded with a competent reading of Ravel’s familiar Bolero, each soloist contributing their particular instrumental timbre to the haunting, snaky melody that few people can banish from their ears once they’ve heard it. To me, although the title is Spanish, the mysterious, wandering tune has more of an Arabic flavor—though of course, much of what is most distinctive about Spanish music is precisely its Moorish and North African content. Once again, Sidney Hopson contributed his crisp snare drum as a constant beat throughout the entire piece.